It seems like I get more and more people telling me they’re frustrated with their black & white conversions. It’s a topic all it’s own and this short post won’t do it justice, but the most important aspect of a black and white image is the control over tonal contrasts. 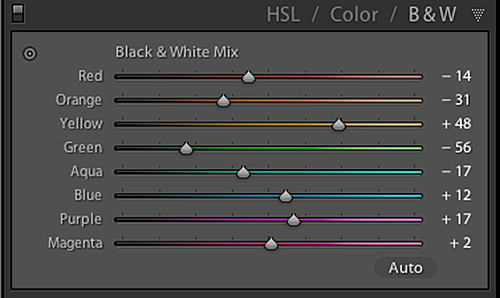 You can do this in a number of ways, but – assuming you’re using Lightroom – if you’re just cranking down the Vibrance or Saturation on your images as a first step, you’re robbing yourself of the controls in the HSL/Color/B&W panel in the Develop Module. The principle is the same in Photoshop, ACR, and probably Aperture too. Using the B&W mix allows you to assign different tonal values to the colours in the image, and therefore control them. See the shot at the top of the post? Same ugly little gourd, 3 different mixes, primarily in the orange and yellow channels. I used no other tools here. If you love black and white photographs but don’t feel you have the control you want, the best thing you can do is go play with the B&W channel mixer. 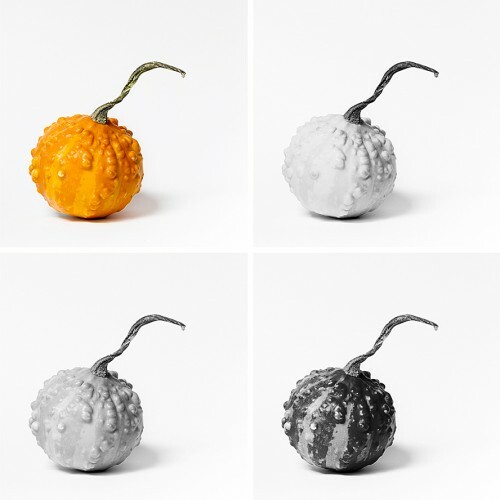 The B&W mix you see in the screen shot (above) is from the last version of the gourd, the oranges pulled quite dark, the yellows pulled quite light. I’d give you settings for the others, but I don’t think they’ll be as helpful to you as simply grasping the idea yourself by spending 20 minutes in Lightroom with a couple images. Once you’ve got a feel for that, the Tone Curve is next. 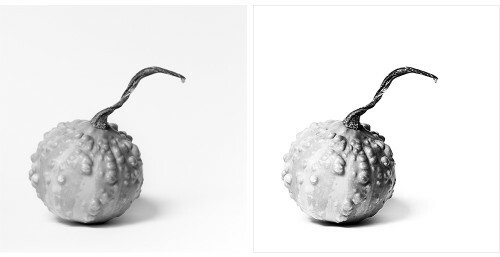 The images above are the same photograph, one without Tone Curve tweaks, and the other with a strong S-curve (pull down the shadows and blacks, pull up the highlights and whites.) 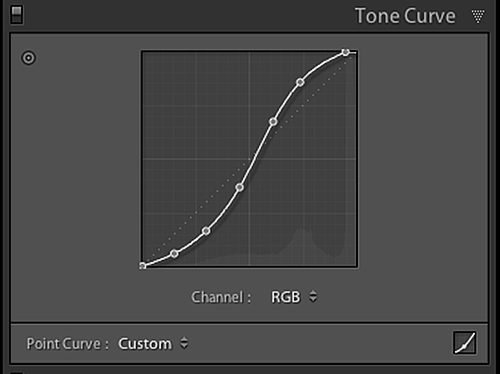 Tone Curve allows you to more carefully establish the relationships between tones than a simple tweak to the Contrast slider, which is a bit of a blunt instrument. Again, my intent’s not to teach you the ins and outs but to encourage you to go play with this tool. Don’t push too far, and keep an eye on the histogram, but between Tone Curve and the B&W Mixer, you’ll have the tools to begin honing your black & whites. Timely post, I had my first play with the B&W mix last night when trying to lighten skin tones in a portrait. It offers an astonishing level of control. I will definitely be making it my first port of call for B&W from now on! Thanks for this insight David. Generally when deciding to convert to B & W I’ve been using Nik Silver Efx. Do you think that lightroom could be a general replacement for it? Leon, I think Silver Efex Pro does a better job than most people are able to, only because most people don’t take the time to learn or just don’t want to do so. I love Silver Efex Pro. It gives amazing results, but I prefer to do this stuff myself. Aha moment! Use BOTH tone curve and mixer! Thanks, David. I had not made that huge leap of 1 + 1 !! And refreshing NOT to have a pre-set . Ha,ha! Off to tweak the jack o’lanternd. I’ve just started using the Nik Silver Efex Pro plugin for Lightroom and Photoshop. Seems to be the conversion tool of choice for most B&W photographers. I especially like what they call “Structure,” which is like LR’s “Clarity,” but better. I use LR’s graduated filter and brush tools a lot, but Silver Efex’s control points are another and perhaps better way of doing edits of selected parts of an image, more like masking but easier. Don’t forget to play with the white balance sliders, too. They can really affect what you can do with the B&W Mixer. thx for these tips. I’m using LR4 and created a virtual copy of an image I was working. On one image, I did this manually with tips contained in this page. On the copy, I used the LR presets. The manually converted image looks much better, though the red high contrast preset did a decent job in this case. Thanks for the clear and simple explanation and illustrations. Very helpful!